In the global economy, the war for talent has never been more intense. Today's employers face increasing competition for the best workers, even as lackluster economic conditions have increased the labor supply. In fact, for every job opening an employer can be inundated with applicants, especially when using online job postings. According to a recent MSNBC story, employers may see as many as 100 times more applicants from an online posting than they would have expected in the days of the printed “classified ads”. With a deep talent pool of well-qualified workers, one might think hiring decisions would be easier than ever. Still, for the average employer, the hiring process can be arduous at best, and choosing the right new hire can be one of the most difficult decisions a manager or business owner will face. The stakes have never been higher. So just how high are the stakes? Employers large and small, for-profit and non-profit, know the pain of making a bad hire. Whether they stay on the job for a month or a year, an employee with poor job-fit not only tends to under perform, but they can also bring down the performance of coworkers - this is the compounding effect of a hiring mistake. On the other extreme, an employee with high job-fit can provide a substantial and lasting return on investment (ROI). For a growing number of employers, personality assessments are the key to evaluating job-fit, while gaining competitive advantage in the hiring process. Already used by Fortune 500 companies for decades, Inc. Magazine reports that personality assessments can be particularly beneficial for smaller employers as well, "where the impact of hiring the wrong worker has a disproportionate effect" on organizational performance. The same technological advancements that have increased the quantity of applicants for every opening can now be leveraged to increase the quality of the ultimate hire. 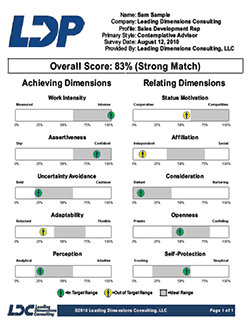 The Leading Dimensions Profile (LDP) is a comprehensive personality inventory, delivered online with results provided instantly to the employer via email or through a secure online portal. The LDP provides employer-friendly reports which reveal the applicant's primary work style, as well as ten dimensions of potential compatibility for a given position. The LDP indicates the applicant's overall personality profile using a four-style grid, which reveals how they may approach everyday activities such as: teamwork, selling, servicing, learning, handling conflict, and even managing others. Together, the LDP's overview and expanded reports provide the employer with valuable insight to support an effective hiring decision. Jerry Donella, PHR, of Right Fit Profiles, leverages the LDP to help his clients identify an applicant's fit to the job and work environment. One such client, a Texas-based equipment manufacturer, compares an applicant's characteristics to the LDP profile of top performers already in the position. According to Donella, “this helps the client to avoid costly hiring mistakes by ensuring the candidate is a 'fit' for the job, and clearly shows us where to focus in developing the individual should the applicant become an employee”. Using the available LDP reports, Donella's clients gain both selection and development guidance within a single assessment. This reduces hiring costs and increases the potential return on investment offered by the LDP. Rick Daughtrey, PHR, of Leading Edge Profiles, follows a similar approach. According to Daughtrey, the LDP provides a particularly effective selection tool when hiring customer service associates and sales professionals. Daughtrey's firm advises clients on how to use the LDP within an existing selection process, whether for entry-level or more senior positions. Daughtrey has found success with the LDP in a variety of workplace applications, from small non-profit organizations with few employees, to large multinational companies with the most complex selection programs. Building a high-quality talent pipeline can be a daunting task for recruiters, especially when placing call center associates. With average turnover in excess of 40% within the industry, employers face an urgent and costly challenge. While online job posting services can provide access to job seekers, employers have little time to wade through the volume of responses they receive from each post. Facing such a challenge, one company developed an innovative approach using the LDP to recruit and prioritize its applicant pool for Call Centre Associate positions. The employer began by developing a profile of the ideal Call Centre Associate by administering the LDP to a sample of its current employees. Based on the results, a Score Card was developed to compare job seekers' LDP scores to the ideal profile of the call center's top performers. Recruiters posted announcements on regional online job boards, directing job seekers to complete the LDP via a link within the announcement. To attract interest, the posting offered a free Personal Style Report (generated by the LDP) to participants. As soon as each job seeker completed the LDP, recruiters were alerted by email, allowing contact to be made within minutes of the job seeker's initial interest. All job seekers received a copy of their LDP Personal Style Report via email, with the most promising candidates being offered an initial interview with the employer. By leveraging the LDP in this way, recruiters received over 1,000 responses, already stack-ranked and prioritized according to the job seeker's match against the ideal profile. Within just weeks of implementing the LDP for recruiting, the employer discovered that new hires matching the LDP profile achieved 41% higher performance than those hired despite lower LDP scores. The result: fewer interviews, more quality hires, and higher productivity. Even with an effective recruiting strategy, the process of screening candidates can present quite a challenge for employers. With high unemployment and few openings, it seems all too common for job seekers to provide a dizzying array of information, much of which is handcrafted to leave the most favorable impression on a prospective employer. This is especially true among candidates for sales positions, where the ability to "sell one's self" may be a key factor. For many employers struggling to navigate through the fog of exaggerated resumes and glowing references, the LDP provides an objective selection tool with the validity and job-relatedness that will keep the employer out of harms' way. With a steep learning curve and intense competition in the industry, a professional employer organization (PEO) looked to the LDP's Work Style Report to help them screen candidates for openings within its sales development team. The PEO developed a benchmark of its highest performers based on the LDP's ten personality dimensions, and then evaluated performance differences between those who matched the LDP profile and those who earned lower scores. The result: on average, sales reps closely matching the LDP profile closed 19% more sales than those who were a lesser match to the profile. In yet another example, a timeshare company implemented the LDP within an existing selection process for its on-property sales representatives. The employer recognized that the most successful reps were those who could quickly assess a buyer's interest and qualification level, and then adapt their sales presentation in order to answer potential objections and close the deal. Not a job for just anyone, and yet the employer was inundated with applications from those claiming to have just what it takes to be successful in sales. The company used the LDP's four-style grid to identify candidates with the drive and intensity to reach performance targets, the assertiveness to control the sales process, as well as the sociability required to promote positive customer relations. 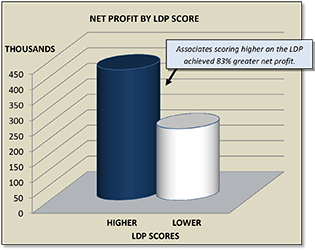 The result: sales reps who matched the LDP profile earned 59% higher net sales than their lower-scoring peers. 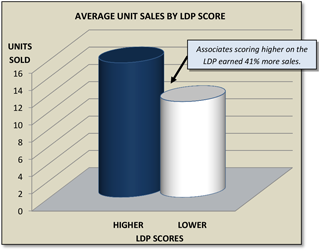 Not only did higher LDP scores lead to increased sales, the higher scoring reps were also more efficient. In fact, higher scoring reps sold over $2,000 more per prospect - 79% more than their peers. As noted earlier, small businesses are most impacted when openings remain unfilled or when new hires struggle to work through the learning curve for a position. In a workplace where employees already wear multiple hats, the impact of a hiring mistake can reach every corner of the organization. This is especially true within managerial positions, where poor performance can erode teamwork and hamper productivity. Realizing that an inconsistent or ineffective hiring process means lost opportunity for its franchisees, a multinational staffing company developed LDP profiles for a variety of roles within its locations, including General Manager. A key role within the franchise, the General Manager oversees administrative and operational functions, manages the customer service and sales activities within the territory, while also directing the financial and compliance activities of the office. Often faced with diverse and challenging responsibilities, the most successful General Managers share certain key characteristics found within the LDP's ten dimensions. Within each aspect of their work, operational, sales and financial, General Managers who more closely matched the LDP profile achieved higher performance (in both subjective and objective categories). The result: higher performing General Managers develop higher performing teams, allowing the company to achieve more with less. Although personality assessments like the LDP are often utilized within entry-level and high volume selection programs, they have been used to assess senior leadership candidates for more than a century. While technology may have changed the delivery method over the years, the basic premise is still the same: executive-level placement requires an exhaustive review of the candidate's portfolio, including leadership style and related behavioral dimensions. The LDP provides just such a review, allowing search committees and selection professionals to anticipate how an individual will respond within a leadership role. In addition, the LDP's Leading Style Guide provides an excellent follow-up resource, allowing a newly placed leader to further develop their style by leveraging strengths identified via the LDP. The LDP describes a person's work style by measuring two primary sources of drive and motivation (Achievement Drive and Relational Drive) and ten supporting dimensions: Achievement Drive describes the focus and intensity with which an individual approaches common activities as well as long-term goals. At opposite ends of the Achievement Drive continuum, are two primary behavioral patterns: Methodical and Urgent. Work Intensity, the drive to extend effort in meeting or exceeding expectations when performing common tasks. Assertiveness, the confidence level in approaching one's role and in asserting opinions. The LDP Leading Activities Summary reveals the individual's likely comfort level with 20 key factors, allowing coaches and trainers to focus on specific development opportunities. Uncertainty Avoidance, the propensity to accept risk in making decisions or taking actions in uncertain situations. Adaptability, the interest in, or comfort level with changing or unplanned circumstances. Perception, the extent to which one relies on intuition and experience (versus methodical analysis) in making decisions. Relational Drive describes the extent to which an individual engages relationally in common circumstances. At opposite ends of the Relational Drive continuum, are two primary behavioral patterns: Guarded and Expressive. Status Motivation, the drive to be personally recognized for efforts and accomplishments. Consideration, the awareness of, and propensity to contemplate others' feelings and needs. Openness, the desire to learn and share personal information with others, including strangers. Affiliation, the desire to collaborate or affiliate with others in performing common activities. Self-Protection, the level of trust in the intentions or reliability of others. To that end, LDC offers its flagship product, the Leading Dimensions Profile (LDP), through a global network of affiliates. Affiliates in the US, Europe and Australia provide their clients with access to the LDP, along with world-class support and business intelligence that drive performance. selection processes you would like to implement.